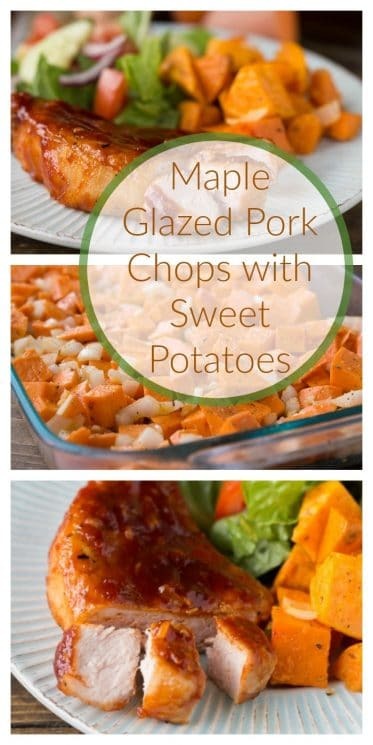 Sweet Maple Glazed Pork Chops with Sweet Potatoes baked up in the oven as your pork chops cook! This is the perfect fall dinner with all the flavors of the leaves turning and settling on the ground. I’ll be honest, I’ve never been a huge fan of pork chops. But these have changed my mind! Maple glazed is the way to go and the little bit of tomato paste in the sauce works perfectly! 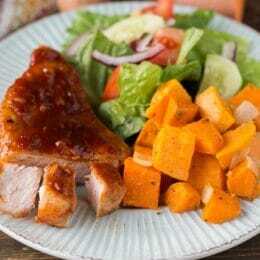 Why will your Kids Eat these Maple Glazed Pork Chops with Sweet Potatoes? 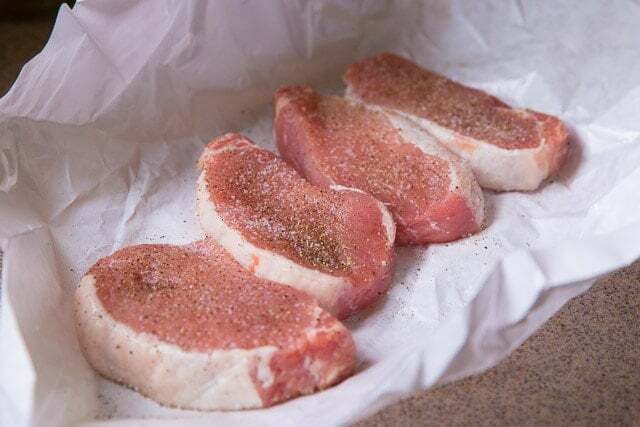 My first tip is to use the boneless pork chops, this will make it easier for your cute kiddos to eat when dinner time rolls around. They’ll love these because the maple glaze is just sweet enough and the potatoes are soft and a fun bright shade of orange. My plate needed a pop of green, so I threw together a quick salad. Even though potatoes are a vegetable I tend to eat more fruits as snacks so I felt okay double up on the veggies for dinner. 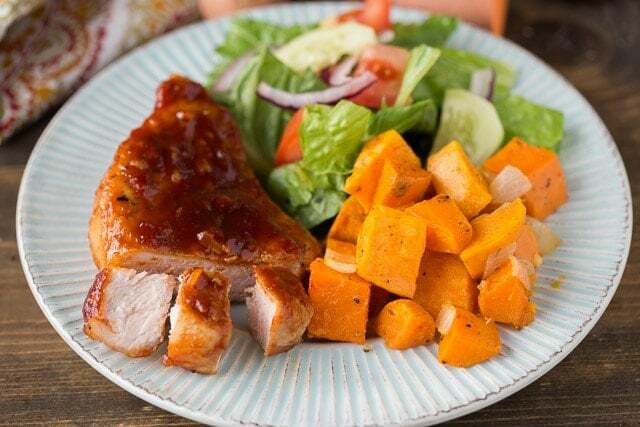 If this recipes sparks a new love for pork chops like it did for me, check out our slow cooker pork chops! 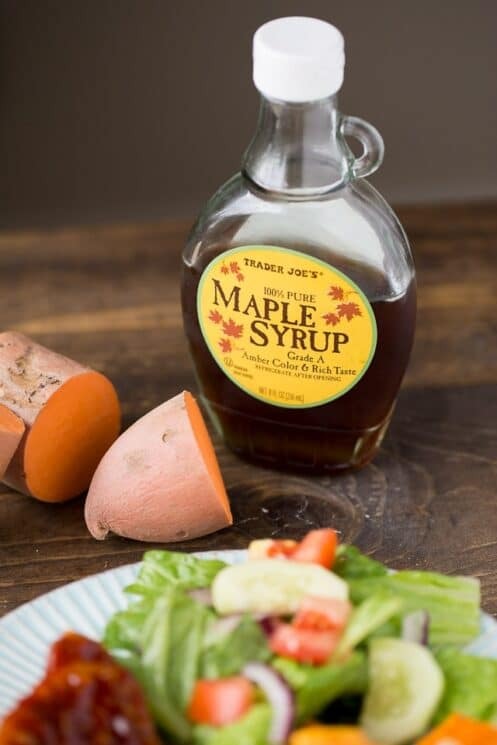 Whenever you bake or cook with maple syrup make sure it’s pure maple syrup! The pancake syrup is chocked full of corn syrup, dyes, and other artificial ingredients that you don’t want anything to do with. Sweet potatoes come in many varieties, I chose to go with yams because I love the bright orange color! But even if your family isn’t a fan of sweet potatoes, any type of potato will do! 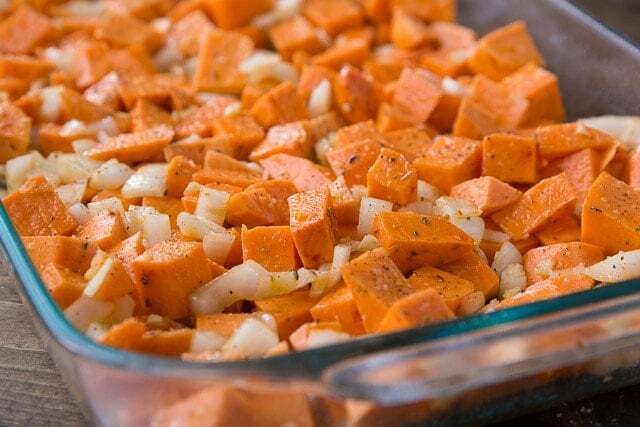 Just chop them up in 1-inch or smaller pieces, mix onion, olive oil, and spices and pop in the oven! Sheet pan/casserole sides are one of my favorites because they can easily cook up in the oven while the main dish simmers away. Less fuss more family time! This recipe makes four pork chops and unless your kids are teenagers they probably won’t eat an entire chop. Good thing, because you’re going to want to have their leftovers after you read them their bedtime story! 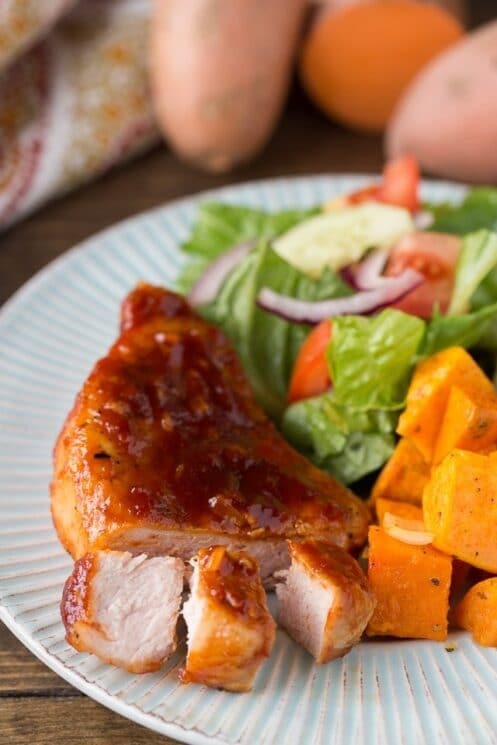 Enjoy these Maple Glazed Pork Chops with Sweet Potatoes! 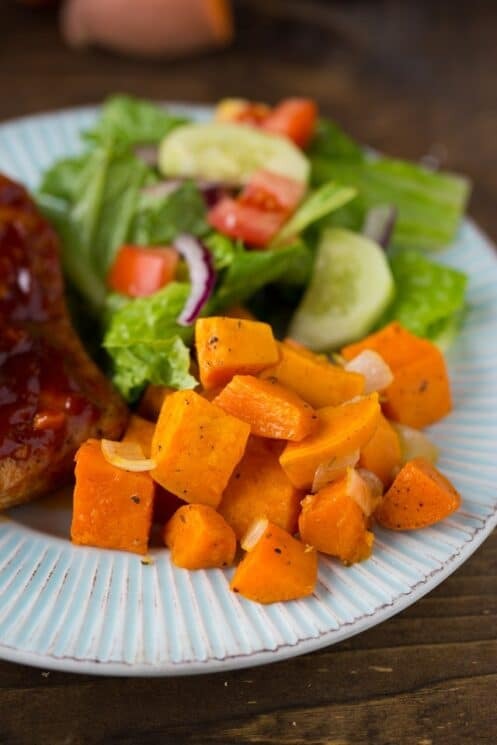 Sweet Potatoes: We’ll start with the sweet potatoes so that you’ll be pulling them out of the oven when the pork chops are done! Preheat oven to 350 degrees. Peel sweet potatoes (I used yams) and chop into 1 inch pieces or slightly smaller. Then take your half of an onion and chop that up as well, I used a yellow onion. Place potatoes and onion in a bowl and add olive oil, paprika, oregano and salt. You can add pepper here as well if you want. Stir until coated and then pour out onto a cookie sheet and bake for 40-50 minutes or until tender. If you’re wanting to make them a little more tempting to your kids, you can sprinkle them with parmesan cheese for the last 10 minutes of baking! Pork Chops: Place olive oil in a pan over medium-high heat and add pork chops. Cook on each side for 4-5 minutes or until cooked through. While your pork chops cook, make sauce. Combine maple syrup, tomato paste, soy sauce, cider vinegar, minced garlic and ginger. 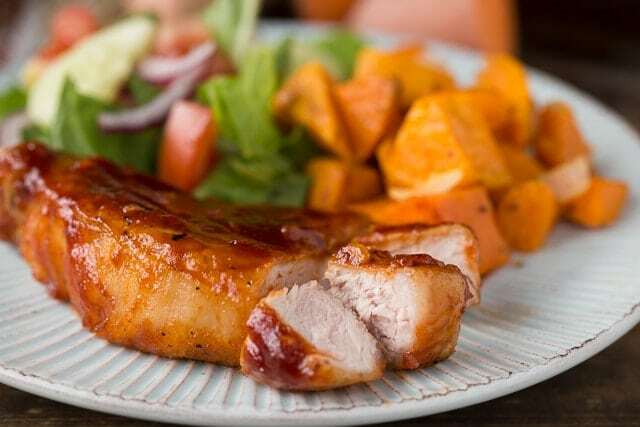 Add sauce to the pan just before your pork chops are cooked and continually spoon sauce over them. Serve warm with extra sauce poured on top, enjoy!